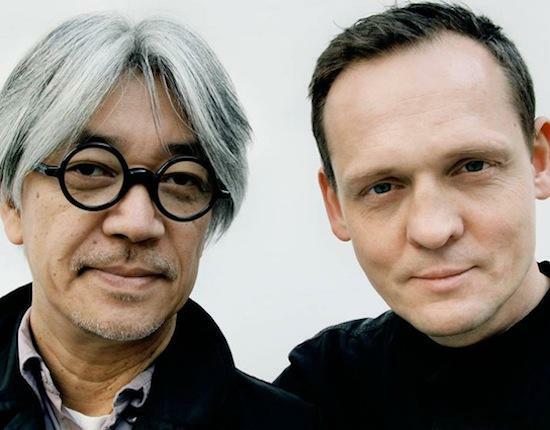 German producer and founder of electronic label Raster-Noton, Alva Noto, and Japanese Academy Award-winning pianist Ryuichi Sakamoto have been collaborating together for more than a decade, experimenting with the boundaries between music and noise, combining Sakamoto’s atmospheric, melancholy piano with Noto’s minimalist production and quietly pulsating beats. Tomorrow, June 19, sees the duo play as part of Yoko Ono’s Meltdown festival at the Royal Festival Hall. The pair are known to mix multimedia art installations with their music on the live stage, creating an immersive audio-visual experience that explores their experimental and esoteric compositions, often placing most emphasis in the drawn out, structured silence between the notes rather than the notated instrumentation of the composition itself. Mostly playing with only the two of them on stage and syncing their sounds to create a perfectly balanced mix of live piano and well-placed samples and electronics, they manage to create subtle orchestration that can be classified as both music and art. To be in with a chance of winning e-mail your answer to the following question to comps@thequietus.com, with ALVA in the subject line, by 1pm Wednesday 19 June. To read the Quietus Competition terms & conditions, click here. Which of the following films did Ryuichi Sakamoto not soundtrack?